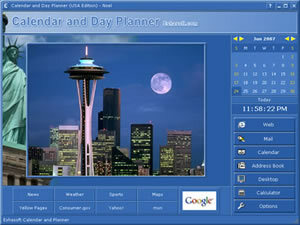 Version 2019 of calendar and day planner software officially released. Internet Explorer-compatible Web browser with built-in pop-up blocker. This no-nonsense pop-up blocker blocks pop-ups and pop-unders when you're surfing with Calendar and Day Planner. Buy Calendar and Day Planner (USA Edition) today for only $39.95. This is a one-time fee and the calendar will never expire. Softpedia guarantees that Calendar and Day Planner is 100% CLEAN, which means is does not contain any form of malware, including but not limited to: spyware, viruses, trojans and backdoors. Calendar and Day Planner is the best organizer program I have ever used. It has a very modern appearance with a nice calendar/organizer and address book. The web browser works well and even has its own popup blocker. The images that accompany each month are a nice touch as well. Calendar and Day Planner saves me time and keeps me organized... MP3 feature is awesome. If you have any questions about your Calendar and Day Planner software. WebinterX Ltd. Your privacy is safe - Calendar and Day Planner Software does not contain any "Spyware" or "Adware".